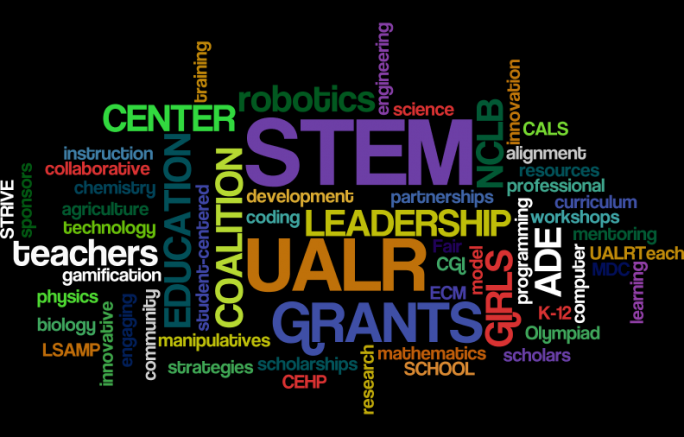 The UA Little Rock STEM Education Center’s mission is to foster high-quality Science, Technology, Engineering, and Mathematics (STEM) education for all students in grades K-20. We work with students, teachers, administrators, parents, policymakers and the general public by supporting high quality curriculum and professional development and sharing the many resources of UA Little Rock faculty, staff, and students with schools across Arkansas. We collaborate with internal and external partners on sponsored projects to improve STEM learning and teaching. One facet of UA Little Rock’s mission is the responsibilities to use quality instruction to instill in students a lifelong desire to learn; to use knowledge in ways that will contribute to society; and to apply the resources and research skills of the University community to the service of the city, the state, the nation, and the world in ways that will benefit humanity. To collaborate with education service providers in higher education, the community, and Education Service Cooperatives to meet the STEM needs of K-12 schools. The above mentioned Goals will be accomplished through the Math and Science Specialists funded by the Arkansas Department of Education as well as by UA Little Rock faculty and staff working collaboratively with the Center. The STEM Education Center is located in ETAS 125.